Pope signed a reserve/future contract with the Chargers on Saturday, per the NFL's official transaction log. Analysis: Pope was waived from the 53-man roster ahead of the Chargers divisional-round loss to the Patriots. The 25-year-old also spent time with Houston and Seattle this season, though he hasn't seen game action since 2016. Pope was waived by the Chargers on Friday, Ricky Henne of the team's official site reports. Analysis: Pope was let go to make room for kicker Nick Rose on the active roster. After initially being elevated from the practice squad on Dec. 13, Pope did not play a single snap with the Chargers before ultimately being cut. The 25-year-old hasn't played in an NFL game since 2016. 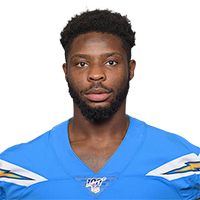 Pope was promoted from the Chargers' practice squad to their active roster Thursday, Ian Rapoport of NFL Network reports. Analysis: Pope was added to the Chargers' practice squad a couple of weeks ago when Melvin Gordon originally suffered his MCL injury, and now, with backup Austin Ekeler (neck/concussion) ruled out for Thursday's game against the Chiefs, Pope will be added to the active roster for added insurance at the running back position. Gordon is reportedly pushing to play Thursday night, but Pope would likely operate as the No. 3 back should the star tailback remain sidelined. Pope signed with the Chargers' practice squad Wednesday, Sam Fortier of The Athletic reports. Analysis: With Melvin Gordon (MCL) banged up and considered week-to-week moving forward, the Chargers opted to add some depth at the running back position to the team's practice squad. Pope would likely be the next man up to join the 53-man roster should another running back go down. Pope was released from the Seahawks' practice squad Tuesday, Bob Condotta of The Seattle Times reports. Analysis: Pope joined the team's practice squad in early November as he had previous stints with the team, but the running back depth is apparently no longer needed with J.D. McKissic (foot) nearing a return. The Jacksonville State product hasn't seen game action since 2016 with the Jets and Seahawks. Pope signed with the Seahawks' practice squad Tuesday, Gregg Bell of The Tacoma News Tribune reports. Analysis: This will be Pope's third stint with the team, as he led the squad in rushing yards during the 2016 preseason but was cut anyway. With Chris Carson's status in jeopardy due to a hip injury, the team wants security in the backfield. 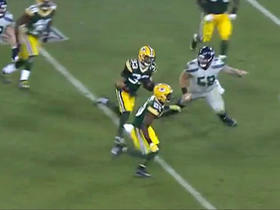 The Green Bay Packers intercepted Russell Wilson five times. Micah Hyde got the final one.